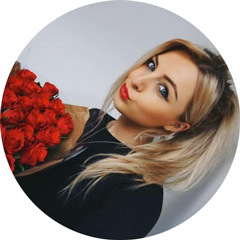 If you use Instagram a lot (guilty!) then I'm going to guess you've probably seen Australian brand Frank Body pop up on your explore page. With an impressive 681,000 followers on their account, it's safe to say they're a pretty big deal and a brand I was super excited to try out after hearing nothing but good reviews from fellow bloggers. I was kindly sent a selection of their products and after giving them a whirl, I want to share my thoughts. I have to start by discussing the packaging as I think it has to be my all time favourite when it comes to body products. I love the brown paper bags, the fonts and zig zag design, the pastel shades and the quirky quotes! Everything about it is cute, girly and fun. It's the kind of packaging you want to show off in your bathroom or on your dressing table! Also, I just want to mention that the brown paper bags do re-seal so once you've opened them, you don't have to worry about them going all over the place as that was my initial worry when I saw them. You also get a LOT of product in those bags - it's pretty deceiving. 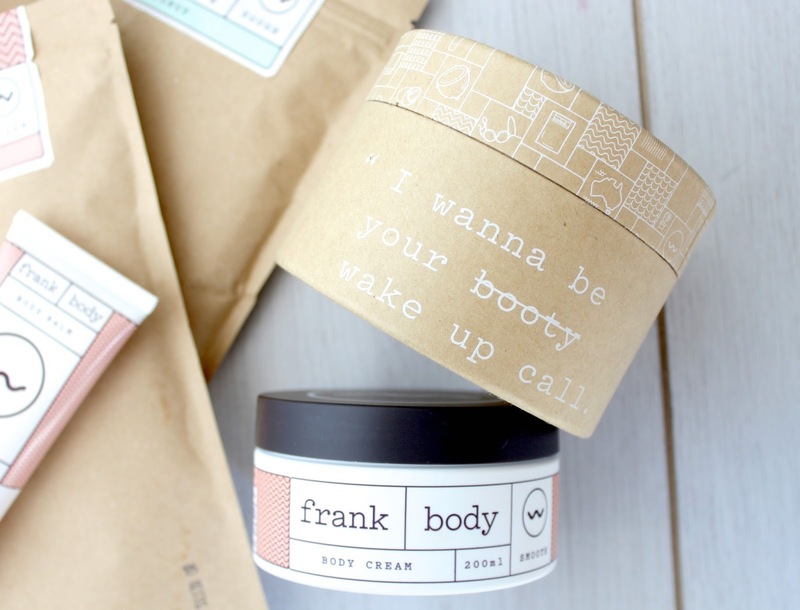 Frank say you'll get at least 8-10 fully body scrubs per pack. Yay! 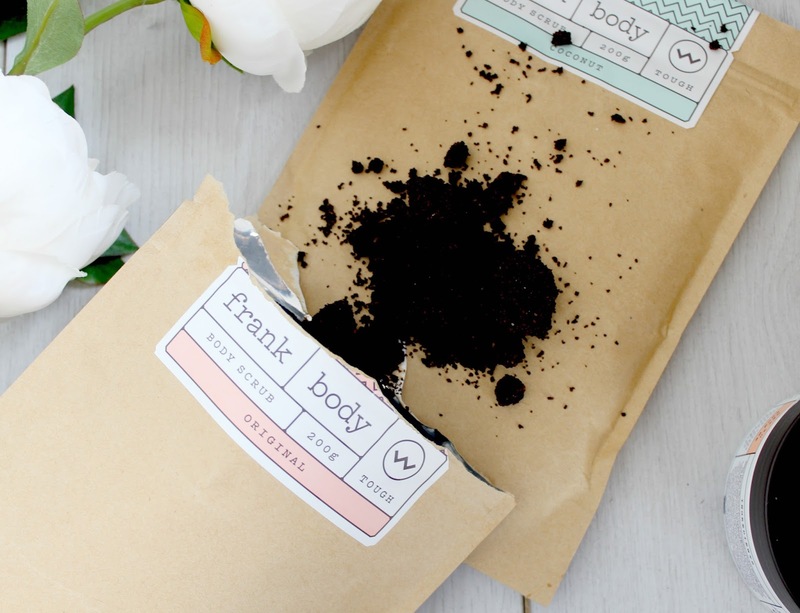 The brand are most well known for their coffee body scrub which is made with natural ingredients that will scrub away dry, flaky skin and also help with conditions like cellulite and stretch marks. I must admit, exfoliating my body is definitely something I don't do enough but this product really makes you want to do it as it leaves the skin feeling so damn soft and radiant. Coffee is obviously the star of the show in this product and whilst it's not something I enjoy drinking, I know it's a popular ingredient in skincare products so it obviously has its benefits. Frank says it will stimulate blood flow targeting cellulite, stretch marks, psoriasis, varicose veins, eczema, acne, and scarring. As well as all that, ingredients like almond oil and vitamin E work to nourish and hydrate the skin. There's nothing worse than scrubs that feel like they strip the skin of all moisture but this one has a great balance of removing dry skin whilst remaining gentle. 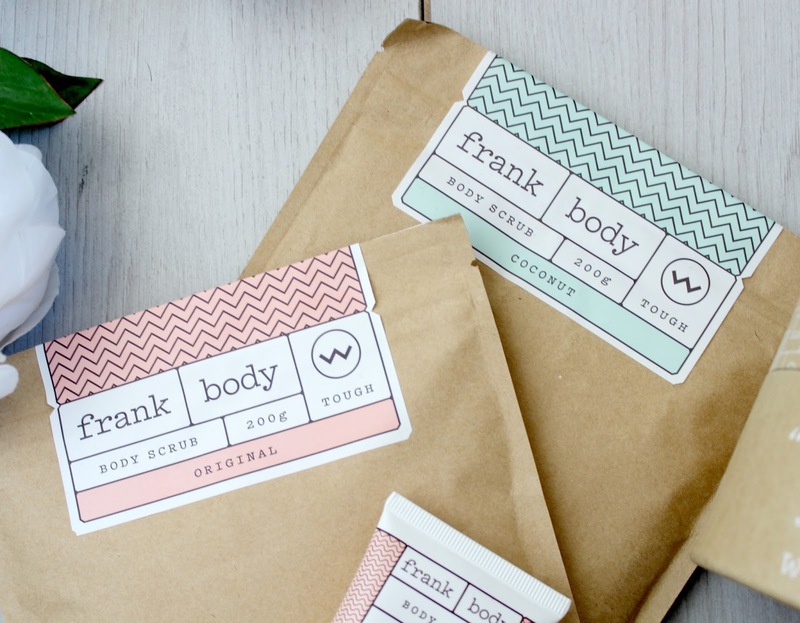 As well as the coffee scrub, Frank also offer a coconut version which is apparently slightly more gentle on sensitive skins. It has the same coffee beans as the original scrub, only this one also has grape seed and coconut oil as well as jojoba beans which ensure the skin is hydrated and moisturised after use. I personally can't tell the difference between the two scrubs in terms of their performance - they're equally as lovely. However, if you have dry or sensitive skin, the ingredients in this scrub are probably more suited to your needs. 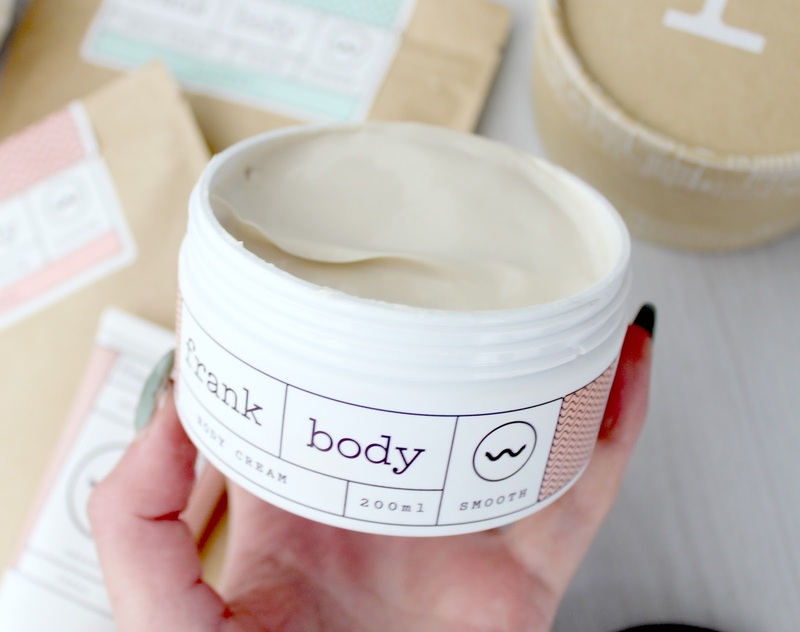 Frank recommend following up their scrubs with their Body Balm which will hydrate and nourish skin and continue to treat problem areas after you've scrubbed! I was really intrigued by this product as I've never used a body balm before and the texture is really different to your traditional body lotions and creams. As you can see from the swatch above, it's a clear balm and when blended into the skin, it leaves a beautiful sheen. 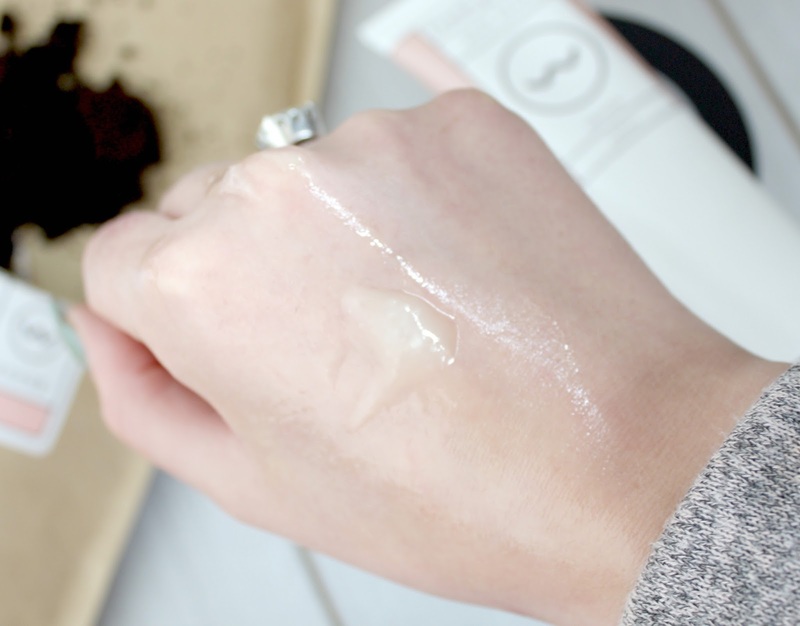 I was slightly worried it might feel sticky as that's what I instantly think when thinking of a balm but that's not the case at all - it sinks in really well and is actually a lot easier to blend than most other body products I've tried. It also smells lovely! Much like Frank's other products, the body balm contains lots of amazing ingredients including coconut, grapeseed, coffee arabica and almond oil which all work together to provide the skin with a whole host of benefits like increased hydration, protection from environmental damage, repair for dry and damaged skin as well as helping to tone and tighten the skin. Much like the scrub, it also works to increase the blood flow and therefore improve the appearance of cellulite, stretch marks, psoriasis, eczema and acne. Beeswax also provides a long-lasting protective coating that shields your skin from the outside elements. So basically, it has everything you could want from a body product - it really is a bit of a wonder balm as it has so many benefits. The final product I was sent is their body cream and this is a more rich and indulgent cream in comparison to the light body balm. I have to be honest, I personally prefer the balm as it's quicker to apply and I find it's something I can easily use every day. However, this is still a lovely product and if you're someone who suffers with dry skin, this is probably better suited to you as it contains shea and cacao butters which are super nourishing on the skin. It also contains coffee seed extract, pomegranate and green tea, all of which will encourage collagen production and protect the skin from environmental damage, moisture loss and dryness. So if you have dry skin - this cream will become your new best friend! Overall I'd say these are really lovely products and I'd highly recommend them, especially if you like to use natural products on your skin. If you do decide to try them, let me know what you think! Do you like the sound of these products? You can find them all here along with more information on the ingredients and the prices. I love their chocolate coffee scrub the most! The coconut one is best for summer as it feels so therapeutic! Good choice! I've heard of Frank products before (Instagram is pretty much my one true love haha), but not in this much detail! The scrubs sound as if they smell and feel AMAZING. I'm on the hunt for skincare products that will help some nasty stretch marks I've just discovered lingering around, and this definitely sounds like something I should give a go. I really need to up my game when it comes to skincare anywhere lower than my neck, I'm terrible at looking after the skin on the rest of my body. Summer is on it's way so I guess now is the time to start. I've seen this a lot on instagram and it does look interesting. I think the body cream would be best for me with my dry skin. I have ALWAYS wanted to try Frank Body but I've just never gotten around to it. So now, I HAVE to! Such a fab review sweets! These sound lovely and I actually haven't heard of them so thanks for introducing them. I also agree the packaging looks so cool and the products seem nice. I absolutely swear by Frank Body, I used their original scrub tonight in the shower. I've only not tried one product from them and its the tub of body cream.I'll be buying it soon because I love everything they've come out with! The body balm looks amazing. Will have to try these products. Great review! I definitely need to try Frank now. The scrub sounds amazing and so does the body balm. I'd want to try the body cream for my feet in the summer time. Thanks for the wonderful post! I just bought the body scrub! Looking forward to trying it out!! Like you, I absolutely adore the packaging! It's so cute and unique! I'd love to try the exfoliating body scrub. 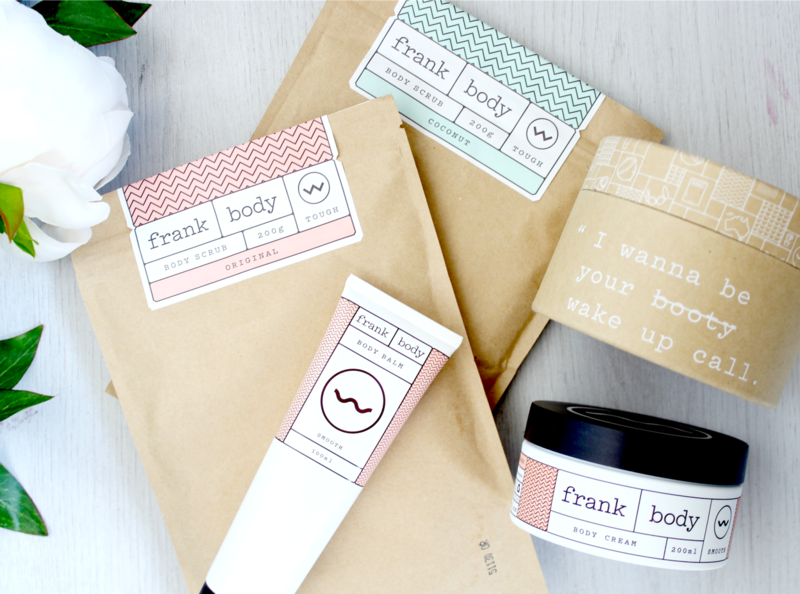 I love Frank Body products!! I need to try some of these products they look so cool! I definitely want to try out Frank in the future! I've heard such good things about their products! Dying to try them out! I've seen Frank on instagram loads and it looks and sounds amazing. Will definitely have to give it try, especially the body balm.